PEBBLE BEACH, Calif. – August 3, 2017 – World-renowned automotive artist Tom Hale will unveil several new pieces including a stunning study of the luscious Lamborghini Aventador at the Automotive Fine Arts Society (AFAS) exhibit during the Pebble Beach Concours d’Elegance on Aug. 20, 2017, from 9:00 a.m. to 4:30 p.m., in Carmel, California. Hale and several other distinguished Automotive Fine Art Society (AFAS) members will showcase breathtaking artwork, including paintings and sculptures alongside beautiful collector cars at the 67th anniversary of the Concours. Lamborghini launched the Aventador in 2011 as a successor to the popular Murciélago. The V12 powered super car combines the tradition of the Lamborghini brand with a level of innovation that takes the “House of the Raging Bull” into unexplored territory. 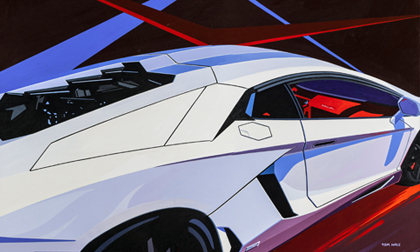 Hale’s 36-inch by 48-inch acrylic on canvas painting features a sensuous white Lamborghini coupe with a blood red interior. His modern abstract piece uses geometric shapes to juxtapose their sharpness against the fluid lines of the wild Aventador. Hale is known throughout the country for his beautiful masterpieces. His love for automotive fine art started at the age of seven when he began sketching futuristic automobiles. To fuel this passion, Hale attended two art schools, worked at General Motors as a styling designer and spent 17 years at American Motors Corporation until he realized he wanted to pursue fine art on a full-time basis. Hale has resided in Michigan for most of his life. He studied art at Michigan State University and attended the Art Center College of Design in Los Angeles. There, he received a Bachelor of Science degree with Honors. Hale’s paintings are shown extensively throughout the United States and have been exhibited in both national and international competitions. He has received numerous awards including the “Gold Medal of Honor” from the American Watercolor Society. The successful artist has sold 3,000 original paintings to people in 13 countries. His original art is displayed at distinguished automotive events, such as Pebble Beach, Meadow Brook, Amelia Island and Auburn. To date, he has been commissioned to create more than 65 posters for various events, Concours and exhibits. These included posters for the Concours d’Elegance of Texas, the Eyes on Design and the St. John Concours d’Elegance. Visit http://www.autoartgallery.com/afas/afas-member-hale.html for more information specifically related to Tom Hale and his artwork.